Maybe it’s because I was an air force brat with no hometown. Maybe it’s because my extended family hasn’t always been close. Or maybe it’s because, like so many North Americans, I’m the daughter and granddaughter of immigrants. In any case, I’ve always enjoyed researching my family tree. More than just names and dates, I like to learn about the family: which relatives parents named their children after, what everyone did for a living, where they migrated (or emigrated). I’m saddened when I see how many children never reached adulthood or how young my female ancestors were when widowed but happy to discover stories of relatives who succeeded in building new lives for themselves—and I’m always eager to learn more. Because this is my story and my son’s, too. I wonder whether we Catholics are curious about our spiritual family tree. We know that God is at the root of our spiritual family tree, which continues to grow because it is nourished by his love. But what do we know about the other branches of the tree? How much do we know about them? And what could their faith journeys teach us? Yes, we have the list of Adam’s descendants in Genesis 5, the genealogy of Jesus in Matthew 1, the examples of the faithful in Hebrews 11. But in actually reading the scriptures we learn how they came to and lived out their faith. In reading the works of St. Augustine, St. Teresa of Avila, St. Thérèse of Lisieux, and more, we learn how they grew in faith. Through books such as Pope Benedict’s collected catecheses on the fathers and doctors of the Church, we learn more about how these men and women helped the Church to grow. By searching in books such as Voices of the Saints or on websites such as CatholicSaints.info, we learn about how the faith of the saints and blesseds was tested and bore fruit. And through the website for the Holy See, we can learn about the lives and the writings of the popes and the ways the Holy Fathers affected the Church. 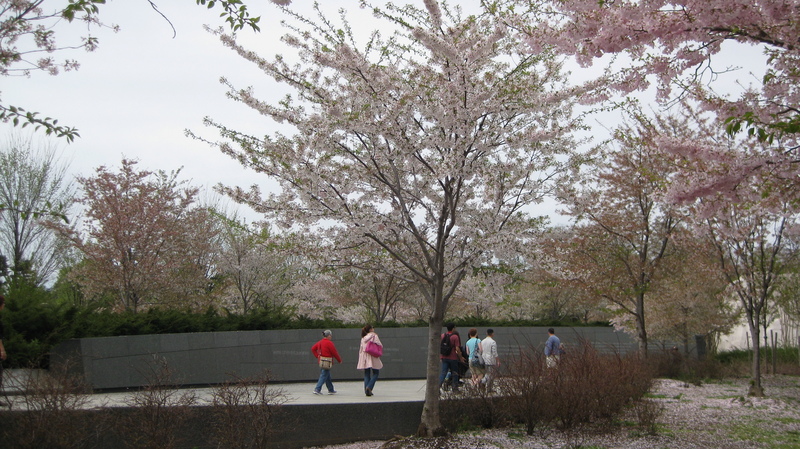 I pray that we would take the time to learn more about our spiritual family tree—our story as Catholics. Therefore, since we are surrounded by so great a cloud of witnesses, let us also lay aside every weight, and sin which clings so closely, and let us run with perseverance the race that is set before us…. The Blessed Virgin is like a good mother who, not content with looking after all her children in general, watches over each one separately. Last week, the women in my parish’s Catholic Women’s League group joined teachers and parent volunteers to teach some children about the rosary. The children learned about the prayers we say on the various beads and a bit about the mysteries we reflect on. They also got to make a simple rosary and have it blessed by our parish priest. In the rosary, we pray through Mary to God; she carries our prayers to the Lord. We meditate on the life of Jesus and his mother, from the Annunciation to the Ascension to the Assumption and Coronation of Mary. It can take as little as fifteen minutes to pray five decades, and so we could easily pray one decade each day. The rosary is a powerful spiritual weapon. How many of us have a rosary (or even more than one) that we received on the occasion of our First Holy Communion, purchased in a Catholic gift shop, or got in the mail from a Catholic charity? 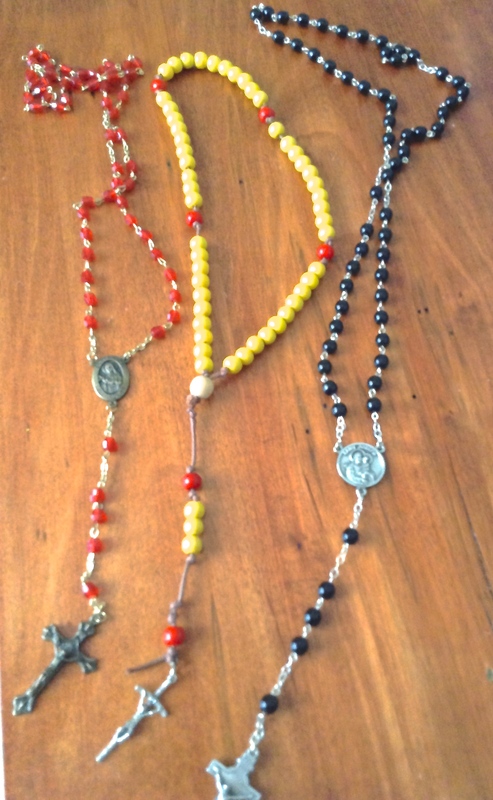 How many of these rosaries sit in a drawer, on a night table, or in a purse, unused? When I bought my first rosary a little while after I began attending Mass, I prayed five decades nearly every day. Over time, I found that it became one more to-do in a busy day, and I seldom found the time to pray even one decade. But lately I’ve been making this time to quiet my mind, focus on Jesus, and ask for prayers for others and for myself. If it’s been a while since you’ve picked up your rosary or used a rosary app, or you’ve never prayed the rosary before, I encourage you to give this meditative prayer a try. When we have handled something fragrant, our hands perfume whatever they touch, let our prayers pass through the Blessed Virgin’s hands, and she will give them fragrance. According to the Wikipedia, people will observe a wide range of events this month, from Leif Erikson Day to Thanksgiving and from National Fire Prevention Week to Fair Trade Month. For those of us who are relatively new to the Catholic Church and may not be aware of the fact, Catholics also observe the month of the Holy Rosary. In fact, today we celebrate the feast of Our Lady of the Holy Rosary. Pope St. Pius V established this feast to honour the Blessed Virgin Mary for her intercession—prayed for through the rosary—that led to the Christian forces’ victory in the Battle of Lepanto on October 7, 1571. If a little while (or maybe a long while…) has passed since you’ve prayed the rosary, this feast day is a great time to pick up your beads or rosary ring and say a decade or more. And during this 40 Days for Life campaign, you could pray the rosary using pro-life meditations, such as those available through Priests for Life or the United States Conference of Catholic Bishops. But maybe you’ve never prayed the rosary. Maybe you’re a convert and the idea of praying the rosary is strange or uncomfortable for you; as Scott Hahn wrote in Rome Sweet Home, before he became a Catholic, he ripped up the rosary that had been his grandmother’s. 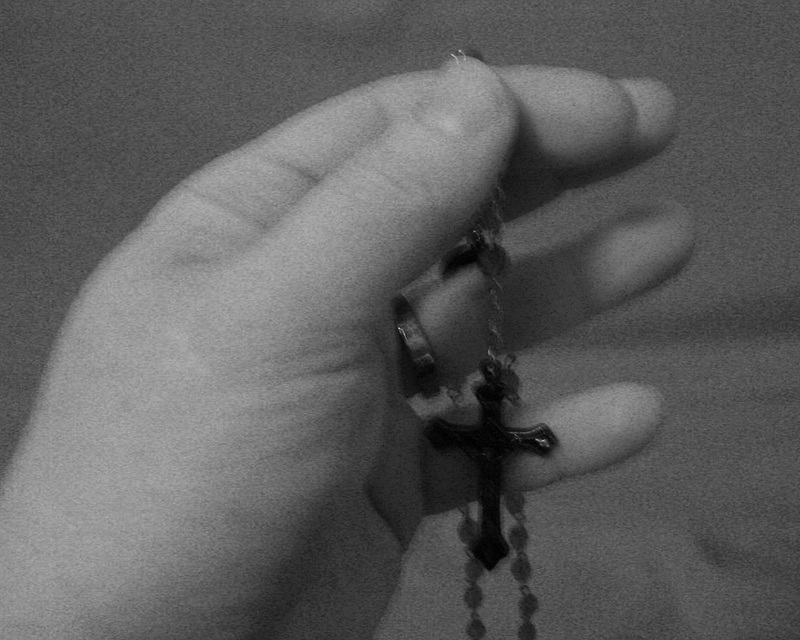 But on his journey to the Catholic Church, Scott was given a rosary and began to pray the rosary regularly. He came to describe it as “a most powerful prayer—an incredible weapon” and found that meditating upon the mysteries deepened his understanding of Scripture. If you’ve never tried to pray the rosary, I encourage you to give it a chance, whether you use a rosary you’ve made or been given. It does take a little time to learn the prayers and mysteries (which you can find on the Holy Rosary website, for example), but not long to pray through them; even a few minutes is enough time to recite a decade and think about some of the events in the life of Jesus. 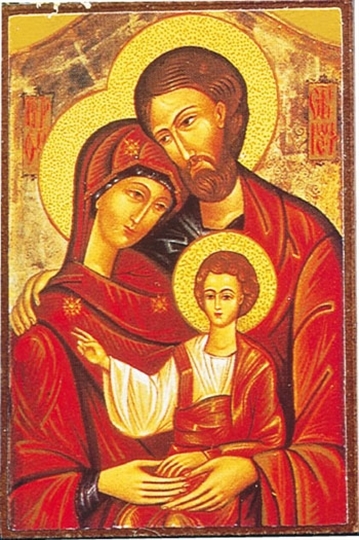 In the Rosary we turn to the Virgin Mary so that she may guide us to an ever closer union with her Son Jesus to bring us into conformity with him, to have his sentiments and to behave like him….The Rosary is an effective means for opening ourselves to God, for it helps us to overcome egotism and to bring peace to hearts, in the family, in society and in the world. Sometimes we struggle to make what seem to be simple choices. For a week, I debated whether to accept a friend request on Facebook. The choice should have been easy—just click one box or the other—but I was torn. I thought and prayed about it, and I finally reached a decision over the weekend. Not only was I relieved to have made a choice, I also knew that it was the right choice. Suddenly I felt motivated to take on craft projects and mending that had waited for the mood to strike me, sort clothes to toss or give away, and basically take on the world. While making this decision took far more mental energy than it should have, my example shows how making the right choice can lift a weight from our shoulders. But what if the decision is mission-critical—a question of conscience? Beginning at s. 1776, the Catechism teaches us about moral conscience: what our conscience is, how it’s formed, how it helps us reach decisions. The Church recognizes that sometimes making the right choice is difficult but we “must always seriously seek what is right and good and discern the will of God expressed in divine law” (s. 1787). To this purpose, man strives to interpret the data of experience and the signs of the times assisted by the virtue of prudence, by the advice of competent people, and by the help of the Holy Spirit and his gifts (s. 1788). Prudence is the virtue that disposes practical reason to discern our true good in every circumstance and to choose the right means of achieving it (s. 1806). In an age that places a high value on independence, many of us make decisions based on our experience and the virtue of prudence, but we don’t necessarily bring others’ advice and the help of the Holy Spirit into the process. I pray that we would be willing to benefit from the wisdom of the people God has brought into our lives and to ask for the gifts of the Holy Spirit so that we’d be better able to make good decisions. Holy Spirit…Grant me the gift of knowledge, so that I may know the things of God…Grant me the gift of counsel, so that I may choose what is more conducive to my spiritual development…Grant me the gift of wisdom, so that I may rightly direct all my actions…(from “Prayer for the Gifts of the Holy Spirit” by St. Alphonsus Liguori, quoted in The Confirmed Catholic’s Companion: A Guide to Abundant Living). As a child, I looked forward to and dreaded receiving report cards: I appreciated my teachers’ positive comments but always feared my grades wouldn’t be what I hoped. As a parent, I also have mixed feelings about report card day: I hope that my son’s grades will show improvement where it was needed and worry that they won’t. Yesterday was report card day. The main thing I noticed was that my son’s teachers would like him to improve his work habits so that he can achieve his full potential. This morning, I was thinking about how common report cards are in our society: workplace performance reviews, ratings of the financial situation of companies and countries, reviews of politicians’ achievements during their time in office, restaurant inspections that result in a passing or failing grade, critiques of the entertainment value of new movies or CDs. But there are no report cards to tell us how we’re doing as Christians. If we were to assess ourselves, would we find ourselves earning a “Good,” “Satisfactory” or “Needs Improvement” for the quality of our prayer life; the love we show toward others; our obedience to God’s will; or the wise use of our talents, spiritual gifts, and resources? Are we “progressing well”? Thankfully, we aren’t graded in this way. We know the bar is set high—and, being human, an A+ is far out of our reach. But we also know we have a merciful and loving God who wants us to strive to be more like Christ and come to him for forgiveness and reconciliation when we know we’ve failed. When I was going through RCIA, I knew I would see the priest for reconciliation before I was received into the Church. Doing some research to learn more about reconciliation, I came across information on how to do an examination of conscience on a daily basis and before going to confession. BeginningCatholic.com offers advice on conducting a daily examination of conscience. We think about our day—the ways God has blessed us, as well as our faults—and we ask God for his forgiveness and for his help in doing better the next day. More information on daily examinations of conscience is provided at Catholic.net. BeginningCatholic.com also features “A Detailed Catholic Examination of Conscience” we can use before reconciliation. Following the Ten Commandments (see ss. 2084 to 2557 in the Catechism) and the precepts of the Church (see ss. 2041 to 2043 in the Catechism), this examination can help us reflect on our behaviour and determine how we can improve. A few weeks ago, I heard on the radio that movie theatres want shorter trailers because the previews give away too much. I’d love to see fewer and shorter trailers, but I understand why the promos are several minutes long: we want to know what to expect. One the many things we’d like to know about in advance is heaven. Just think about all the books by people who have had “near-death experiences” and want to tell the world what heaven is like; TV shows with psychics claiming the ability to communicate with audience members’ deceased loved ones about “the other side”; and, of course, doomsday predictions and cults. All this speculation reveals our need for reassurance that something lies beyond this life—and our longing to know what that something is. Even Jesus’ disciples were not immune to wondering about the end times. In Matthew 24 and 25, we can read Jesus’ words about what is to come and when. Jesus said the gospel must be preached to all nations before the end (24:14). Only the Father knows when the end will come (24:36), so we need to keep ready (24:44). When Jesus returns, we will see “the Son of man coming on the clouds of heaven with power and great glory” (24:30-31*), and Jesus will sit on his throne and judge the nations (25:31-46). He will dwell with them, and they shall be his people, and God himself will be with them; he will wipe away every tear from their eyes, and death shall be no more, neither shall there be mourning nor crying nor pain any more, for the former things have passed away (21:3-4). Some people mock Christians for waiting for Jesus’ return but, as Peter reminds us, “The Lord is not slow about his promise…but is forbearing toward you, not wishing that any should perish, but that all should reach repentance” (2 Peter 3:9). So we need to do more than just wait; we need to strive to live out our faith as a witness to those who need to hear and receive the gospel message. And we can take comfort in the knowledge that Jesus is with us “always, to the close of the age” (Matthew 28:20). If you are new to the Church, you might like to read more about this topic in ss.668 to 682 and ss. 1020 to 1060 of the Catechism. From Elizabeth Enright to Agatha Christie to Earlene Fowler and too many other authors to mention here, I’ve long enjoyed untangling the threads and trying to solve the mystery before the author reveals all. The same goes for the procedurals I watch on TV. But as our presiding priest pointed out at Mass this week, there are relative mysteries, which we can figure out, and then there are absolute mysteries, such as the Holy Trinity. Since, as he said, we won’t fully understand the mystery in this life or the next, we should simply adore the Lord. To those who love the challenge of solving a mystery, not trying to solve one might seem unthinkable. And people in general like to categorize and define things in ways that make sense. Think about the way we arrange everything from grocery items to newspaper sections to apps. Not being able to fit everything into neat boxes can make us uncomfortable. Still, human knowledge, theories and research can’t explain the mystery of the Trinity. The idea that the Father, Son and Holy Spirit are three persons but one Lord is a mystery we can only try to wrap our minds around. the Holy Spirit comes from the Father in Jesus’ name (see John 14: 26). Today we can easily become jaded and even fail to treat everything from holy buildings and books to the Holy Trinity with the proper reverence and respect; for example, consider the way some worship songs treat God as a “buddy” and not as our Lord. I pray that, as we contemplate the mystery of the Trinity, we would still feel a sense of wonder and a desire to simply worship the Lord. My house got a little noisier this weekend. Okay, a lot noisier. My son adopted a bird with special needs. 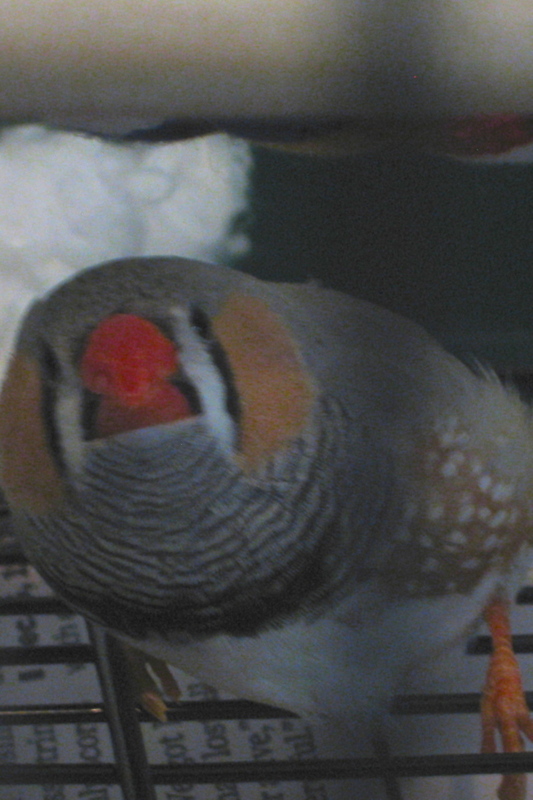 Our local pet store was giving away a zebra finch with balance problems. For some reason, he can’t fly well and has trouble perching. Still, he enjoys our company, eats his food messily like most pet birds, and sings his little heart out…which he started at 6:45 a.m. today. It was probably more pleasant for my son to wake up to birdsong than to a beeping alarm clock. I know some people would not have chosen this bird. He’s kind of wobbly and clumsy. But my son enjoys caring for him and the finch, Syd, has decided we’re his flock. That’s how it is with God and us. Even though, since we’re human, not one of us is perfect, God loves and cares for us and uses us to fulfill his plans, as and where we are. For example, Abraham was elderly when God made him the father of a great nation (see Genesis 21). Moses was a fugitive who had killed a man, yet God chose him to lead Israel to freedom (see Exodus 2 and 3). David was a young shepherd when God chose him to be king (see 1 Samuel 16). Peter was an uneducated fisherman, yet he was the rock Jesus chose to build his church on (see Matthew 16:18). And reading about the saints tells us that many were poor, unschooled, ill, or simply cantankerous, yet God used them to spread the good news and bring healing and comfort to those in need. Sadly, our society tends to pigeonhole people, deciding they can’t contribute because of their age, their mental or physical challenges, or their social status. Which can lead to disturbing social changes such as the rising abortion rate for babies with Down syndrome or pushes to enact or expand laws on assisted suicide. But how can we value people so little when everyone has worth in God’s eyes? 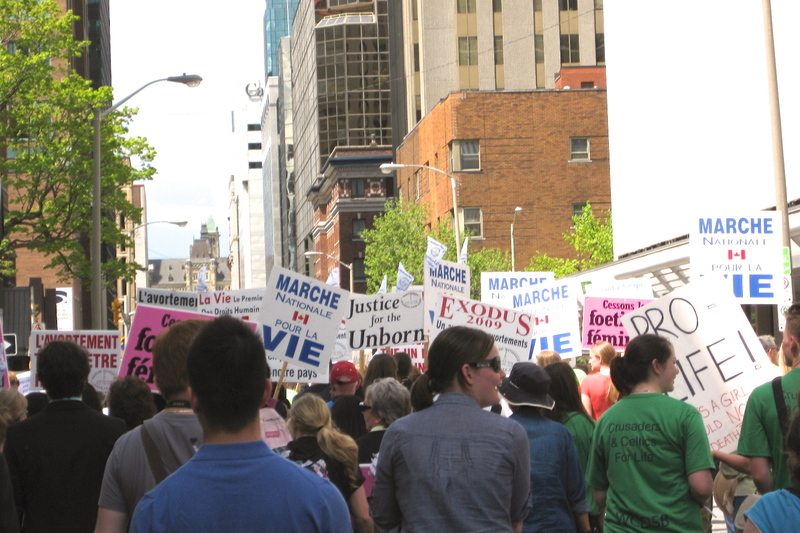 On Thursday, for the first time, I walked in the March for Life. People came to Ottawa from all over Ontario and Quebec: families with young children, seniors, busloads of high school students and parishioners, and priests and religious; people from all ethnicities and walks of life; people who walked in the March and those who could not but held up signs and waved to encourage those who did. How wonderful it would be if we could pull together like this more often on the big issues, and if we could focus each day on one another’s strengths and our common ground so that more of us would use our gifts and sing out like Syd.